One Dozen Important Topics You Might Not Have Learned Enough About in Medical School ALSO INSIDE: Why Are ACOs Important in the Future of Medicine? While incremental changes are made along the way, you’ll still need to continue to make important decisions about health insurance for you and your employees, especially when it comes to managing premium costs. * Marsh and the Association do not provide tax, investment or legal advice. Please consult with your professional advisors for guidance on these issues. Please call Marsh at 800-842-3761. We serve members who want assistance in evaluating the medical insurance choices before them. We can assist you with the information you need to make the critical choices on the road ahead. and Why Are They Important in the Future of Medicine? Opinions expressed by authors are their own, and not necessarily those of The Bulletin or the Santa Clara County Medical Association and the Monterey County Medical Society. Acceptance of advertising in The Bulletin in no way constitutes approval or endorsement by the Santa Clara County Medical Association or the Monterey County Medical Society of products or services advertised. Address all editorial communication, reprint requests, and advertising to: Pam Jensen, Managing Editor 700 Empey Way San Jose, CA 95128 408/998-8850, ext. 3012 Fax: 408/289-1064 pjensen@sccma.org © Copyright 2011 by the Santa Clara County Medical Association. the population to 1/8 of what it is now, which is historically sustainable. The task would require a suitable combination of carrots and sticks, including the end of tax write-offs for children, maybe large cash payments for voluntary sterilization. But, those are just my ideas; do any of you have better ones? John T. Jameson, MD, is the 2010-2011 President of the Monterey County Medical Society. He is board certified in pathology and is currently practicing at Natividad Medical Center. Trials and Tribulations Experiencing the strength, energy & resilience of the human spirit By Joseph Andresen, MD Since my last editorial column, Mother Nature has thrown her worst at us with the tragic earthquake and tsunami in Japan that has claimed tens of thousands of lives, destroyed entire cities, and displaced so many. If that wasn’t enough, the nuclear accident and leakage of radiation into the environment is a catastrophic event still unresolved. Our hearts and prayers go out to the people of Japan. If you haven’t already, consider making a donation to the Red Cross: https://american.redcross.org/site/ Donation2?idb=0&5052.donation=form1&df_id=5052. The cry for greater freedom throughout the Middle East sparked by social media, the new information age, and decades of suppression highlights our daily news. We are witnessing a time of new hope and possibilities, accompanied by war, strife, and loss of life. Doctors Without Borders, winner of the 1999 Nobel Peace Prize, is on the front line in these areas of conflict. Their mission is to bring quality medical care to people caught in crises regardless of race, religion, or political affiliation. They are a nonprofit organization and depend on private donations to carry on their work. Please consider making a donation to aid their efforts in Japan, the Middle East, and around the globe: http://www.doctorswithoutborders.org/donate/overview.cfm. Closer to home, March 23, 2011, marks the one-year anniversary of the Patient Protection and Affordable Care Act (PPACA) being signed into law. Much publicity has been given to the political conflict surrounding attempts to de-fund the health reform law in Congress. A number of state attorney generals have issued challenges to the constitutionality of the individual mandate that is proceeding through the courts. Not surprisingly, a recent poll of Americans revealed that 22% thought the law had been repealed and another 26% weren’t sure. The public remains evenly divided on support of the new law. Again, not surprising with the amount of misinformation and confusion that currently exists. So will the law be repealed? No, probably not. With a Democratically-controlled Senate and Democratic president, the law will remain in effect for the foreseeable future. How have you been affected? 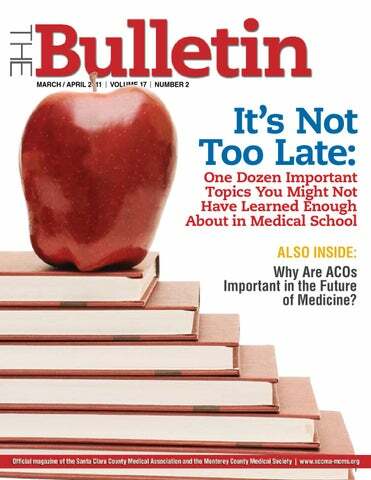 Depends on whether you’ve had Joseph Andresen, MD is the editor of access to medical inThe Bulletin. He is board certified in surance, or used seranesthesiology and is currently practicing vices recently, or run a in the Santa Clara valley area. small business. There has been a ban on preexisting condition exclusions for kids; preventative care now covered without a co-pay; restrictions on annual benefit limits, and removal of lifetime caps, in addition to new tax credits for small businesses providing insurance to their employees, and reinsurance to retirees not yet eligible for Medicare. So why have insurance premiums continued to rise? We have seen recent announcements of large rate increases of greater than 30% by both Anthem Blue Cross and Blue Shield in California. However, both were forced to back down after investigation by the State Insurance Commissioner. Annual increases of this magnitude in the individual insurance market have been a common occurrence for a number of years. The PPACA has not yet dampened this trend. It may be the case that insurance carriers are raising their rates while they can, to further enrich their cash reserves. The hope is that when health insurance exchanges are introduced in 2014, a true competitive marketplace will finally be made available to consumers. In the meantime, new legislation to give the California State Insurance Commissioner the power to regulate health insurance premium rate increase requests, as 20 other states currently do, would be a big step in the right direction. Full implementation of the PPACA comes into effect in 2014. With the most robust benefits, including the health insurance exchanges yet to come, public support is very likely to grow in the future. Linda Bergthold gives a very succinct summary in her recent article entitled, “What Health Care Reform Has and Has Not Accomplished One Year Later.” (http://www.huffingtonpost.com/linda-bergthold/q-and-a-on-healthreforms_b_838243.html.) After tackling such weighty and serious topics above, I would like to end my column sharing a more joyous occasion. Surrounded by 19,596 fans this past Tuesday evening, I found myself immersed in the crowd and the music. For two brief hours, we all felt the freedom, joy, and passion of being lost in the moment. “I’m beautiful in my way, “Cause God makes no mistakes I’m on the right track, baby I was born this way Don’t hide yourself in regret Just love yourself and you’re set I’m on the right track, baby I was born this way.” For two brief hours, we all felt the freedom, joy, and passion of being lost in the moment. For a brief time, the world’s trials and tribulations seemed far away. For two brief hours, music was the common language reaffirming the strength, energy, and resilience of the human spirit. Basking in youthful exuberance, the entire stadium shook as we rose to our feet cheering the last encore, as Lady Gaga and her ensemble exited the stage. MLPF&S is a registered broker-dealer, Member SIPC and a wholly owned subsidiary of Bank of America Corporation. © 2010 Bank of America Corporation. All rights reserved. Managing Professional Risk Tips for Lowering Ambulatory-Care Risks By Karen D. Davis, MA, CPHRM Effectiveness of Risk Management, PMSLIC Insurance Company and the NORCAL Group Among the factors that influence the safety of ambulatory care and the liability risk levels of office-based physicians, three of the main ones are: •	the level of communication with other health care providers about patients’ care; •	the effectiveness of office follow-up processes; and •	the attention given to documentation of telephone calls. The following tips may help physicians and office staff members increase patient safety and lower liability exposure related to these factors. •	When you refer a patient to another physician, have some mechanism in place to determine whether your referral recommendation has been carried out and the patient has been seen by the recommended consultant (or another physician of the patient’s choice). •	Communicate in writing with the consultant about the requested consultation. An effective way to convey significant details to another physician is to prepare a “fact sheet” with the patient’s clinical information and your impression. •	After your patient is seen by a consultant, you and the consultant should establish who is responsible for which aspects of the patient’s care and who will order further testing and consultations if necessary. If there is a question about what you or the consultant will do, you should take the time to communicate physicianto-physician and to document the understanding you reach in your discussion. appointments in order to be assured that the appointment has been made. It is also prudent to notify all patients of all test results (rather than just reporting abnormal results). Such a policy helps close each testing loop and reduces the possibility of patient information “falling through the cracks.” •	Your follow-up system for tests should not only confirm receipt of test results, but also ensure that you review the results. The review should be timely. A test result should never be filed until you (as the ordering physician) have personally reviewed, dated, and initialed it. Without such a method, a positive result can be accidentally misplaced or filed away before you review it or the patient is notified. If the patient later alleges that harm occurred as a result of a delay in diagnosis and treatment, the mishandled test result may well be viewed as concrete evidence of negligence. advice or action. When the call is from a patient, the information should be added to the patient’s chart as soon as possible. •	Giving clinical or medical advice over the telephone without timely, face-to-face follow-up increases your liability exposure. Prescribing over the phone is also risky, as it requires you to assess the patient sight unseen. You should not prescribe for a patient unknown to you without seeing the patient. It is also prudent to have established parameters as to when prescriptions will be renewed by phone. Consider developing the preceding suggestions as policy and including them in a policy manual. Make sure all employees review your policy and consider asking them to sign off yearly that they have been advised of the policy and understand it. Managing Professional Risk is a quarterly feature of NORCAL Mutual Insurance Company and the NORCAL Group. More information on this topic, with continuing medical education (CME) credit, is available to NORCAL Mutual insureds. To learn more, visit www.norcalmutual.com/cme. The practice of medicine is about to undergo revolutionary change. Are you prepared? The California Medical Association is accredited by the Accreditation Council for Continuing Medical Education to provide continuing medical education for physicians. The California Medical Association designates this educational activity for a maximum of 18.75 AMA PRA Category 1 Credits™. Physicians should only claim credit commensurate with the extent of their participation in the activity. The credit may also be applied to the CMA Certification in Continuing Medical Education. Adult Admission Season Pass Under 3 years FREE! See’s Candies 1 lb. Gift Certificate Under 2 years FREE! It’s Not Too Late One Dozen Important Topics You Might Not Have Learned Enough About in Medical School By Philip R. Lee, MD, and Steve Heilig, MPH This article appeared in the September 2010 issue of San Francisco Medicine and is reprinted with their permission. Medical training is intense by design. Starting with medical school, most of the formal curriculum is filled with numerous essential topics, and as scientific and medical knowledge increase, it is further difficult to “triage” what must be learned. Efforts to insert new topics are often fraught with obstacles and resistance. Thus, it may seem ridiculous to suggest that even more be taught in those finite years of formal medical education. It is not ridiculous to suggest that practicing physicians put these topics on your to-learn list now. The following is a somewhat subjective list, but it is based on research, reports, and experience. The discussion of each area is short, with resources listed for those who want to learn more. Again, improvement in these (and other) topics is taking place across the nation. Consider this is an “alert” list conveyed with the hope that future physicians will be aware of these issues on their way to becoming good physicians. The American Medical Association has recognized that drug abuse is one of our nation’s prime public health problems. It’s a clinical problem too, and the biggest culprits are not stereotypical street junkies; they are often everyday patients using legal drugs. For example, despite much progress in reducing smoking, more than 20% of adults still use tobacco. Alcohol overuse is rampant at almost all ages. Abuse of prescription drugs is also rising. As for illegal drugs, the epidemic of methamphetamine addiction has spread everywhere. Yet many MDs are not aware of addiction issues; alcoholism and other problems often go undiagnosed and, even if recognized, untreated. It is known that having MD counsel about smoking, for example, is an important step toward quitting, yet many MDs are uncomfortable even talking about these problems. More doctors need to know more about and apply addiction medicine principles. scurvy or pellagra, may be interesting, but is usually irrelevant. More common problems related to physiological development; drug interactions; and use of supplements, herbs, and other “alternative” or “complementary” approaches are far more important. Unfortunately, patients often do not look for nutritional counseling from their MDs. Physicians should inquire about and become better able to counsel their patients regarding diet and nutrition. Human sexuality has long been taught in a biomedical fashion that often does not reflect real lives. How comfortable is the average MD in talking about sexual practices and health? Homosexuality? Sexual dysfunction? Sexually-transmitted infections? Cultural issues? Teen sexuality? With epidemics of sexually-related disease a part of modern life, and unwanted pregnancy a perennial problem, education and training to elicit such key aspects of patients’ daily lives are vital. This includes contraception. Taking the time to delve into the “uncomfortable” realms of sexuality will not only strengthen rapport, but will allow a physician to address specific health needs that tend to go unrecognized. In Europe, an accepted sexual medicine accreditation and curriculum now exist (see resource below); perhaps the AMA should recognize this subspecialty as well. Research shows that pain, particularly chronic pain, is vastly undertreated. Fortunately, the presence of pain is being considered another vital sign. Concerns about pain at the end of life, as well as the overuse of medications, are being addressed, and the issue of “assisted dying” at the end of life is not now overshadowing the imperative of pain relief. Medical schools are incorporating pain issues into the curriculum; MDs in California who have been required, often against their will, to complete a CME requirement have often expressed reluctant surprise and gratitude at how much they learned. Progress is being made and needs to continue. Medicine is not only about cure, but also about caring for patients when cure is no longer an option. Traditionally, however, death scares many physicians as much as anyone else. Now, however, palliative care is a growing discipline with great rewards. Pain, as noted above, is only part of the picture. Physicians need to know how to help ease patients (and their loved ones) into a palliative mode, to use therapies and medications in optimal ways as death approaches, and to work with skilled hospice and other similar professionals. We all know exercise is good, and often the single most important variable in overall good health. Numerous studies have categorized physical exercise as a positive predictor of good health, disease prevention, and longevity. Our bodies are built to be used vigorously. Yet how many MDs effectively address and motivate patients toward sustainable cardiovascular fitness and weight loss? Although many schools hammer the “stages of change” model into students so they can motivate patients to change their lives, further work needs to be done with practicing physicians to enhance their knowledge of these life-saving techniques. It’s Not Too Late, from page 13 MDs to stay informed and updated on appropriate standards, be they about life-or-death choices, financial conflicts of interest, or other issues. No man or woman is an island. Our environment affects our health in more ways than we usually imagine. So where and how a patient lives and what they eat, drink, and breathe are all factors physicians need to know something about. Knowledge is rapidly growing about the impact of chemicals, infectious agents, irradiation, maybe even global warming on our environment, bodies, and health. An “environmental history” is part of good clinical assessment—particularly for children, who are often most severely affected. Physicians have the unique opportunity to link personal and environmental status, which can be important for prevention and for acute and chronic care. more when a respected clinician speaks and acts on behalf of policy issues and public health. This voice becomes ever more important as modern “health reform” evolves. Physicians have rarely been taught much about how to run a medical practice or manage finances. Thus, the old stereotype about physicians being brilliant at medicine, but ignorant about money, is often not too far from the truth. Depending on what type of practice environment a doctor works in, this is more or less important. But everyone should know, for example, about health insurance, managed care, electronic health records, and other information technology, down to negotiating rent and personnel issues. How to work effectively as a care team is crucial as well. This arena, too, is ever more important with evolving “health reform.” And knowing about how pharmaceutical industry money has intruded on medical practice (and education) is important, too. Anyone who has read this far might have a sense of being overwhelmed by all there is to know and do. It’s a common feeling among physicians (and medical students); it may be one reason for the tragic fact that physicians are at elevated risk for depression, substance abuse, and suicide. Frustration in meeting expectations both external and internal, stress from all sources, and the challenge of leading a balanced life are common problems. Many physicians may also struggle with feeling they have an unrewarding life and career. Physicians need to be aware of resources available to address their needs, able to define and maintain priorities, and recognize the numerous daily rewards that are unique to the medical profession. Doing so can help one retain the idealism that so often motivates the career choice of medicine in the first place. Dr. Philip Lee is chancellor emeritus of UCSF, former United States assistant secretary of health, and professor emeritus at Stanford University’s program in Human Biology and in the Department of Medicine at UCSF. Steve Heilig is director of public health and education for the San Francisco Medical Society and the Collaborative on Health and the Environment and coeditor of the Cambridge Quarterly of Healthcare Ethics. Dynamic Virtual Computer System The same computer system used by all fortune 100 companies WHY ?? timated that the ACO (Accountable Care Organization) provision will remain intact no matter what the final outcome of current health reform law challenges. Described in Section 3022 of the ACA, an ACO is an organization designed to â&#x20AC;&#x153;promote accountability for a patient population and coordinates items and services under Medicare Part A and B, and encourages investment in infrastructure and redesigned processes for high quality and efficient service delivery.â&#x20AC;? This is not a new concept, but one that was first introduced and built on the Medicare Physician Group Practice Demonstration in 2003. The goal is to improve quality, while reducing costs in health care. Despite having the most sophisticated medical care and technologies in the world, our health care system has been roundly criticized for being fragmented, costly, inequitable, and spotty in terms of quality and delivery. Recognition of these shortcomings, and with unsustainable rising costs, ACOs will become a broad part of the Medicare program after demonstrating success in pilot projects. So what are Accountable Care Organizations? ACOs may consist of a variety of providers ranging from integrated delivery systems, primary care medical groups, and hospital-based systems, to virtual networks of physicians such as independent practice associations. The fundamental responsibility of any organized group will be the joint accountability for achieving measured quality improvements and reductions in the rate of spending growth. A strong primary care base will be an essential building block. A variety of payment models can be implemented. One possibility is the opportunity to share in demonstrated savings within a fee-forservice environment where the providers take on no new financial risk. Another arrangement would include limited or substantial capitation arrangements. Here, payments would be unrelated to the volume, intensity, or frequency of service and providers would share in some financial risk for poor quality results or inability to control costs. As one can see, success of such an organization will require strong, well organized leadership of physicians with a strong primary care base who are held accountable for the quality of care provided and the costs of service. A second fundamental will be the linkage of payments to quality improvements that reduce overall costs. Thirdly, progressively sophisticated data will be essential for monitoring quality indicators and demonstrating savings that are accomplished through improvements in care. This may look good in theory, but how will it work in the real world? that there can be an upside for both physicians and patients. The overall effectiveness of ACOs will require additional funding afforded by the ACA. This includes increased support for primary care services such as medical homes. This would involve additional payments to primary care physicians for leading prevention, disease management, and care coordination services reflecting best practices in primary care. Medical homes may involve a team of primary care physicians caring for a specific patient population with shared accountability. How are ACOs different than HMOs of the 1990s? ordination and negotiation between Medicare, Medicaid, and most importantly, providers and private payers will be essential to test these new alternatives. This new paradigm may threaten many of us who have become accustomed and secure in the long established fee-for-service and production based reimbursement system. Yet for those physician groups and organizations that are able to adapt and meet the many challenges of forming successful ACOs, the goals are clear: Higher quality medical care at lower cost is a win-win for both physicians and patients. This is what true health care reform is all about. ACO regulations released March 31 by HHS with a 60-day comment period. Affordable care organizations will be required to accept responsibility for at least 5,000 beneficiaries for at least three years, and must lay out how it will improve care and lower costs when applying for the program. The program is expected to save $510 million to $960 million over three years, according to CMS. More details and discussion, including an analysis by the California Medical Association, to follow in our next issue of The Bulletin! References: 1. McClellan, Mark, et al: A National Strategy to Put Accountable Care Into Practice http://tdi.dartmouth.edu/documents/ publications/A%20National%20 Strategy%20by%20McClellan.pdf. 2. An Engelberg Center for Health Care: Achieving Better Care at Lower Costs through Accountable Care Organizations http://www.brookings. edu/events/2011/0201_accountable_ care.aspx. 3. Ward, MD: ACOs must steer clear of anti-trust issues http://rewardhealth. com/archives/581. 4. Kaiser Family Foundation: The ScanAccountable Care Organizations http://healthreform.kff.org/Scan.asp x?tag=Accountable+Care+Organiza tions. Joseph Andresen, MD is the editor of The Bulletin. He is board certified in anesthesiology and is currently practicing in the Santa Clara valley area. the unlisted code may be reported for each different anatomic location. Is CPT code 68815, Probing of nasolacrimal duct, with or without irrigation; with insertion of tube or stent, reported per duct or per eye? I billed a claim with CPT 63075 and 22554. The insurance denied the 22554, saying that it was inclusive with the 63075. This has never happened before. What’s up? When performing the procedure described by code 43770, Laparoscopy, surgical, gastric restrictive procedure; placement of adjustable gastric restrictive device (e.g., gastric band and subcutaneous port components), would laparoscopic repair of a hiatal hernia be separately reported or would this be considered an inclusive service of code 43770? Answer: Per the CCI edits, 63075, Discectomy, anterior, with decompression of spinal cord and/or nerve root(s) including osteophytectomy, cervical, single interspace, is considered column 1 to 22554, Arthrodesis, anterior interbody technique, including minimal discectomy to prepare interspace (other than for decompression); cervical below C2. Additionally, as of this year, CPT instructions state “Do not report 22554 in conjunction with 63075 even if performed by separate providers. To report anterior cervical discectomy and interbody fusion at the same level during the same session, use 22551,” Arthrodesis, anterior interbody, including disc space preparation, discectomy, osteophytectomy and decompression of spinal cord and/or nerve roots; cervical below C2. Answer: Because laparoscopic repair of a hiatal hernia is not integral to the laparoscopic placement of an adjustable gastric restrictive device, it is appropriate to report the hernia repair separately. Modifier 51, multiple procedures, should be appended to the additional procedure code. For coding questions and reimbursement issues, contact Sandie @ 408/998-8850 or MCMS 831/455-1008 or email sandie@ sccma.org. Answer: Code 68815 is billed per eye. If the procedure is performed bilaterally, report code 68815 with modifier 50 appended. further bleeding; Dr. Colby opposed it, saying that all her symptoms were improved, and they ought to watch the result. The other physicians insisted, however. It was anticipated that the effect would be to reduce the frequency of the pulse and augment its volume. Kitty was told that the doctors thought of bleeding her again, and was asked if she was willing. She said “Yes, anything.” She was then raised up in bed and twenty ounces of blood were taken from her. The physicians seemed to entertain some hopes of her recovery, and agreed upon a course of treatment to be adopted. The (patient’s) father came into her room exclaiming, ‘Thank God, my child, the doctors say there is hope.’ She said nothing. All hope had vanished. Dr. Drake felt her pulse, and said she was dead.” Bloodletting retained its popularity until the latter half of the nineteenth century. Bacteriology, the germ theory, and the growing realization that bloodletting was detrimental to the patient, finally put its use to rest. Accounting and Tax Services for medical practices and professionals • Accounting Services • Income Tax • Bookkeeping • Tax Planning & Preparation • IRS Representation • Financial Statements Diaz-Christians Tax Service, Inc. is a full service certified public accounting firm that offers both superior quality and value to small and midsized businesses. We provide Accounting, Income Tax, and Tax Representation Services. Our accounting services include compilations of financial statements, bookkeeping, and tax consulting. We have been delivering personal service to closely held businesses, high net worth individuals, and trusts for over 28 years. Our approach is very hands-on; we work hard to live up to our promises to be your most trusted tax and accounting advisors. We have a passion for what we do and are focused on delivering exceptional service to meet your needs. Let us show you how we will earn your business and develop a long lasting relationship. Call us to arrange a free consultation at a time and place that is convenient for you and your busy schedule. SCCMA Alliance News The philanthropic and volunteer arm of SCCMA Alliance members have been busy these past winter months and are planning events for spring. Past, present, and future activities include the following: •	Membership: There are currently 133 Alliance members. The membership drive for the 2011-2012 year begins in May. Join now by going to www. sccmaa.org. •	Attendance at CMA Alliance events: Past CMAA and SCCMAA President Debbi Ricks attended the Western States Conference in San Diego, February 3–5. Conference proceedings included information regarding how the AMAA can help local Alliances, how to keep children safe online, information on bullying programs in schools, tips on leadership/ communication skills, and how to get the Alliance message out to potential members in the medical community. Debbi also attended the Anti-Bullying Conference sponsored in part by the Los Angeles County Medical Association Alliance. •	SCCMA Alliance Volunteers in Food Basket Program: Volunteers from the SCCMA Alliance are spending one morning per month helping with the Food Basket Program in Santa Clara County. This program provides groceries for the HIV/AIDS population in the county. Volunteers include Mary Hayashi, Carolyn Miller, and Suzanne Jackson. •	May 2011 marks the return of the Alliance health project, “Not Even for a Minute.” The campaign reminds community members of the dangers of leaving children unattended in vehicles. The health project manager is Alliance member Sally Normington. Information packets including bookmarks, static surface decals, and posters will be sent to hospitals to distribute to over 2,500 families of newborns. honoring the SCCMAA’s “Dedicated County Alliance Member of the Year.” The meeting also will be hosting AMAA leader Pat Hyer and honoring CMAA past presidents. All Alliance members are invited to attend this spring event. Meeting registration forms can be obtained by contacting Suzanne Jackson at email: suepurr@gmail.com. Hotel reservations must be made by April 11, 2011 in order to get the group discount. Please contact Suzanne for additional hotel and conference information. 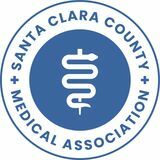 The Santa Clara County Medical Association Alliance is the philanthropic and volunteer arm of SCCMA that consists of physicians, physician spouses, students in training, and friends of medicine. To join, please visit the website at http://www.sccmaa. org. You will also find the most current updates and contact information on that site. Bisphenol A in Register Receipts It’s Not Just for Dinner Anymore By Cindy Russell, MD VP of Community Health, SCCMA When we heat up a can of soup, we are getting more than we bargained for. Along with the vegetables and meat, we are getting a tagalong endocrine disruptor called bisphenol A (BPA) which leaches from the lining of the can. It has been known for many years that bisphenol A is found in baby bottles, food, aluminum cans, and dental sealants, but it is also in many other products we commonly are in contact with as well. The most surprising recent discovery is cash register receipts, where it is found, in some cases, at levels 250-1,000 times higher than in cans. Why is it of concern? It is found not only in many consumer products, but also in amniotic fluid, breast milk, and our bodies. Decades of exhaustive research have linked this particular chemical in low doses with breast cancer, miscarriages, low sperm counts, prostate abnormalities, thyroid abnormalities, neurologic developmental abnormalities, and insulin resistance. There is special concern for pregnant women and the developing fetus. PVC pipe, CDs, eyeglasses, enamel lining of cans, canned soda,26 epoxy resins, toys, and in plastic #7. BPA is also known as polycarbonate and has been found to leach out of plastic and into water or foods, which until now has been thought to be the predominant source of human exposure.2 Recently, it has been found in even higher levels in cash register receipts and other paper products. In some cases, the levels are 250 to 1,000 times higher than in food containers. Paper receipts are now of great concern as a significant consumer source of BPA. Scientific risk assessments from the European Food Safety Authority and the FDA propose a Tolerable Daily Intake(TDI) limit of 50 micrograms per kilogram body weight or 0.5mg/kg body weight per day. 27 Adverse effects on animals, however, have been found in much lower levels in about 120 studies. These levels are what we may consume on a daily basis and are called clinically relevant doses. Some 1,000 studies have been done on BPA. It has been researched for decades and it has been associated with a wide range of adverse effects on endocrine systems including breast cancer, prostate cancer, diabetes, obesity, heart disease, diminished sperm production, early puberty, disruption of sexual differentiation in the brain, and developmental neurotoxicity at clinically relevant levels in the parts per trillion. It has endocrine disruption effects similar to DDT and PCB.37 Bisphenol A is now listed as a chemical of concern by the EPA.3 The widespread use and exposure of this chemical makes it a significant threat to public health. Recent research is finding that many adult diseases, such as infertility, have their origin during development. Irreversible “organizational” effects begin in the fetus and continue through puberty, resulting in adverse health effects, evident only in adulthood. As we know, growing infants and children are the second most vulnerable population as their brains, immune systems, reproductive systems, and breast tissue are immature at birth. Studies on rats and humans have demonstrated BPA can alter the course of normal neural development and can increase aggressive behavior. cholesterol, and antidepressant medications (chemotherapy, anticholesterol, antidepressant)32,34, chloramine in water, antibacterials such as triclosan, and, of course, bisphenol A. When these chemicals do degrade, they may also produce even more toxic substances, i.e. DDT to DDE. In grade school, we learned about the water cycle, the soil cycle, the food cycle, etc. Natural substances are moved from one system to another. In our vital water cycle, the sun heats up water, which moves from lakes, rivers, oceans, and plants via evaporation and transpiration. Then, via condensation and precipitation, water comes back to the earth in the form of rain. The water returns to the lakes, rivers, oceans, and plants, and the cycle continues feeding new life on earth. We now know why cutting down the forest causes the rivers and streams to dry up. It ends the water cycle. In the pollution cycle, many of the manmade chemicals we use everyday may not only bioaccumulate in us, they are also excreted from us to sewage sludge and also thrown away in the garbage. In this way, through different routes, they end up in the water and soil, continuing to pollute the entire food chain, from the basic aquatic life forms, to fish, to mammals, to us again. We know municipal water contains many man-made substances that are now part of the water cycle, including personal care products and pharmaceuticals.33 It is the job of regional water quality control boards to monitor these human pollutants and try to remove them. It is an expensive proposition. Waste water contains all of these pollutants which we flush or pour down our drains including bisphenol A. We are now recycling waste water as well as discharging most of these synthetic chemicals into our bay. What effect is it having on the ecology of the Bay and us? Why not prevent the pollutants from going into the pipe in the first place? In the human waste stream, scientists have found pollutants such as brominated flame retardants as well. They look at sewage sludge, which is considered an “organic” compost and soil amendment used daily on our large agricultural fields. It contains a multitude of pollutants which are monitored, and some limits are placed on some known contaminants. Bisphenol A has a special role as a recycled pollutant in the waste stream as it is used in paper products and now is found in recycled toilet paper in significant amounts – up to 430 mg/kg dry mass. This is due to the fact that cash register receipts and ATM receipts, 40 % of which contain significant amounts of BPA, are recycled with regular paper. “Because of the distinct contamination with xenoestrogens, both paper waste and recycled paper products should not be mixed with biological waste.”1 BPA is also found in recycled cardboard and there also may be other paper products not yet recognized as a significant source of BPA. BPA is used in thousands of consumer products. Here are some common sources: 1. Polycarbonate clear plastic shatterproof containers—Nalgene water bottles, baby bottles. 2. Many Sassy baby products, including those that change color. 3. Aluminum water bottles lined with an enamel coating to prevent leaching of aluminum. 4. Soda cans. 5. Beer and wines fermented in metal vats, lined with BPA. 6.	Credit card receipts. 7.	Credit cards. 8. Pizza boxes with recycled cardboard. 9. Recycled toilet paper. 10. Canned goods — even canned organic tomatoes. 11. Many hard plastic dishes and cups — Plastic #7. 12. Blue-tinted five gallon drinking water bottles — plastic #7 or polycarbonate. 13. CDs. fiers, baby bottles, sippy cups, and straws containing BPA. The statewide ban in Connecticut included not only baby food cans and jars, but also reusable food and beverage containers without an age limit. Washington became the fifth state to pass a ban which included not only drink cups and bottles used by kids under three years old, but also water bottles. Federal legislation has also been introduced to remove BPA from canned goods and food containers (HR 1523).1 In addition, there is legislation to ban BPA as a contaminant in foods via the proposed Federal Food Safety Bill (S 510). This would also expand the FDA’s authority over food processing and production. California introduced Pavley SB 797, which bans BPA not only in baby bottles, but also in canned beverages and food containers for children three-and-under. This passed the Assembly and all committees in the Senate. It was ultimately killed in the Senate due to attacks by the chemical industry claiming there would be no more baby formula, as these cans are lined with BPA. Canada has voluntarily banned BPA in all baby bottles, as of 2008. In June 2010, the Australian government announced the phaseout of polycarbonate plastic baby bottles with BPA. It appears that science has produced overwhelming evidence that BPA is toxic and widespread at environmentally-relevant levels. As a potent endocrine disruptor, it alters normal endocrine function and is especially harmful to pregnant women and the developing fetus, as well as children. This dangerous chemical should be removed from most, if not all, consumer products in a phased fashion, beginning with any container or product used for food or water, medical devices, thermal paper, and then beyond. endocrine disruptor, and endorses efforts to reduce, towards elimination, BPA in consumer products including food containers, baby products, and thermal paper products. For a full report of all references, visit www.sccma-mcms.org and click on the “Going Green” tab. 1.	http://www.scorecard.org/chemicalprofiles/def/hpv.html. 2. Bisphenol A data in NHANES suggest longer than expected HalfLife, substantial nonfood exposure, or both. Environmental Health Perspectives, January 2009, Stahlhut R. 3. EPA lists BPA as chemical of concern http://yosemite.epa.gov/opa/admpress. nsf/eeffe922a687433c85257359003f534 0/78110048d7f696d1852576f50054241 a!OpenDocument. 4. BPA Legislation http://www. saferstates.com/2009/03/bpa-states. html. 5. Asthma. Maternal Bisphenol A Exposure Promotes the Development of Experimental Asthma in Mouse Pups. Environmental Health Perspectives. Vol. 118(2) Feb 2010. Midoro-Horiuti T.
For over 30 years, the Cooperative of American Physicians, Inc. (CAP) has provided California’s finest physicians, like general surgeon Calvin Lee, MD, with superior medical professional liability protection through its Mutual Protection Trust (MPT). Physician owned and physician governed, CAP rewards excellence with remarkably low rates on medical professional liability coverage – up to 40 percent less than our competitors. CAP members also enjoy a number of other valuable benefits, including comprehensive risk management programs, best-in-class legal defense, and a 24-hour CAP Cares physician hotline. And MPT is the nation’s only physician-owned medical professional liability provider rated A+ (Superior) by A.M. Best. We invite you to join the more than 11,000 preferred California physicians already enjoying the benefits of CAP membership. Class-A Medical Building! Fantastic Location! 14777 Los Gatos Blvd, Los Gatos Newer Class-A medical property at gateway of Los Gatos Blvd. Great visibility & location! 15899 Los Gatos-Almaden Rd, Los Gatos Corner of National Ave. and Los GatosAlmaden Rd. Excellent & clean interiors with great location near Good Samaritan Hospital. Great medical building, Class-A, steps away from Good Samaritan Hospital. Ground floor unit, Ti dollars available. and that I owe that much to my teachers, who had confidence in me, and to my patients, who I hope have felt the same. I believe that in giving to patients my listening, understanding, and experience sprinkled with a generous helping of humor, and even a little skill, has rewards far in excess of monetary compensation. The simple act of giving has the emotional satisfaction and contentment that keeps me looking forward to my next day of practice—which is still 24/7! I also believe in my patients, who are often engulfed in unwanted medical and emotional tragedies. I still make house calls, which is a practice not included today in most physician’s list of therapeutic endeavors. One involved a non-reimbursed, life-saving helicopter call and out of town (aerial call) to accompany a paraplegic patient on her dream balloon ride when her local physicians refused to go. I also take care of patients in convalescent homes (where many colleagues fear to tread), as well as seeing office patients, and those who tragically end up with hospice care. I believe giving can create a positive affect so important to patients who return the favor to me, but I also believe in the advancing and exciting new innovations in diagnosis and treatment, which will benefit our entire global community. My medical journey in solo practice is fast becoming an extinct entity and I’m afraid I can be considered a medical dinosaur. Perhaps medicine is advancing at such a great speed, that the time honored doctor/patient relationship will become sadly challenged and jeopardized. I only hope the new wave of physicians will share the beliefs of giving that have made for me a practice filled with joy and satisfaction. It is a work still in progress and certainly not yet finished. Richard L. Mahrer, MD, has been an SCCMA member since 1956. He has practiced internal medicine in San Jose for over 54 years. JOIN US IN THE BEAUTIFUL SAN FRANCISCO BAY AREA! Contra Costa County is one of nine counties that comprise the San Francisco–Oakland Bay area, and is located directly east of the City of San Francisco. Offering a plethora of recreational and social activities, Contra Costa boasts one of the fastest growing work forces among Bay Area counties, with growth in its employment base driven primarily by the need to provide services to a growing local population. A great place to live and a great place to work, make Contra Costa County your employer of choice! Family Practice or Emergency Medicine Physician We are currently seeking a Family Practice or Emergency Medicine Physician with a minimum 5 years ED experience for a 20-bed Emergency Department in the Contra Costa Regional Medical Center (CCRMC, located in the City of Martinez. CCRMC sees 60,000 patients per year in its Emergency Department and Fast Track. Family Medicine residency program works very closely with the ED. We offer a very competitive salary, pension and benefits package. Governor Brown signs budget bills, including Medi-Cal and Healthy Families cuts Governor Jerry Brown signed budget bills on March 24 containing $14 billion in cuts, including reductions in Medi-Cal and Healthy Families programs, which the California Medical Association (CMA) strongly opposed. However, the budget bills prohibit the state from implementing the Medi-Cal cuts unless they are approved by the Centers for Medicare and Medicaid Services (CMS). CMA’s advocacy team will be doing everything possible to stop those cuts before they are implemented. CMS denied the 2008 Medi-Cal reductions, and although that issue is still under appeal, the state has not presented any new evidence that would cause CMS to change its opinion. The cuts in the bills the governor signed included: •	A 10% reduction in Medi-Cal provider reimbursement rates. •	Mandatory Medi-Cal co-payments for physician office visits ($5), non-emergency use of the emergency room ($50), and inpatient hospital stays ($100 per night up to a $200 maximum). The $5 Medi-Cal copayment, never before required in California, also applies to dental and pharmacy visits and Medi-Cal prescriptions. •	A “soft cap” on physician office visits of seven per year. This is called a “soft cap” because physicians will be allowed to authorize more office visits if they feel they are medically necessary. •	Increases in premiums and co-payments for children enrolled in Healthy Families. CMA delegation meets with CMS, members of Congress on health reform, Medi-Cal, Medicare Members of the California Medical Association (CMA) executive committee, county medical society leaders, and a contingent of California medical students recently traveled to the nation’s capital for the American Medical Association’s Lobby Day. The CMA delegation met with 30 members of Congress and their staffs and with Donald Berwick, MD, administrator of the Centers for Medicare & Medicaid Services (CMS). Protect access to care, CMA urges CMS’s Berwick. states to provide Medicaid (Medi-Cal in California) recipients access to medical care equal to the care of privately insured persons. CMA leaders also discussed accountable care organizations (ACOs) and asked that CMS allow flexibility for different models that reflect local community needs. CMA emphasized that ACOs should be led by physicians. CMA leaders also told Dr. Berwick that CMS should focus on providing resources to help independent solo and small group physicians succeed in the era of health care reform. Other topics of the daylong meeting included a long-overdue California geographic payment formula fix; how the value index should be cost and risk adjusted to account for California’s higher practice expenses and the socioeconomic health status of patients; and a new quality assessment proposal from CMA’s Institute for Medical Quality. CMA’s Capitol Hill meetings press Congress on wide range of issues. FTC “red flags” identity theft rule A federal appeals court has ruled that physicians who bill patients after providing services are not subject to the expensive and burdensome requirements of the Federal Trade Commission’s “red flags” rule. The rule, which took effect last year, requires financial institutions and “creditors” to implement identity theft detection and prevention programs. Despite objections from the California Medical Association (CMA), the American Medical Association (AMA), and others in organized medicine, the FTC had insisted that physicians who regularly bill their patients for services (including co-payments and coinsurance) are considered “creditors” and thus are subject to the red flags rule. CMA argued that the rule is unnecessary for most physicians because the Health Insurance Portability and Accountability Act (HIPAA) and California laws impose strict requirements to safeguard the confidentiality and security of patient information. CMA and AMA also objected to the red flags rule requirement that physicians verify the identity of their patients before agreeing to treat them if the patients did not pay in-full at the time of the visit. The intention of the requirement was to prevent identity theft so that if a patient provides a false identity, the wrong person would not be billed for the physician’s care. We hate lawsuits. We loathe litigation. We help doctors head off claims at the pass. We track new treatments and analyze medical advances. We are the eyes in the back of your head. We make CME easy, free, and online. We do extra homework. We protect good medicine. We are your guardian angels. We are The Doctors Company. The Doctors Company is devoted to helping doctors avoid potential lawsuits. For us, this starts with patient safety. In fact, we have the largest Department of Patient Safety/Risk Management of any medical malpractice insurer. And, local physician advisory boards across the country. Why do we go this far? Because sometimes the best way to look out for the doctor is to start with the patient. To learn more about our medical professional liability program, call The Doctors Insurance Agency at (415) 506-3030 or (800) 553-9293, or visit us at www.doctorsagency.com. CRAFT YOUR IMAGE TO MATCH YOUR PROFESSIONALISM Medical ofﬁce build-outs take a specialized skill to get done right. With rents nearing $4.00/sq ft in spaces adjacent to the local hospitals many doctors are converting professional ofﬁce space to medical use for almost half the cost. Married to a surgeon, I understand the business of medicine and can help you manage your facilities costs to help reduce your overall cost structure. Trust the experience of Kokinos Builders to build an ofﬁce that reﬂects your commitment to professionalism. DOWNTOWN MONTEREY OFFICE FOR SUBLEASE Spacious, recently remodeled, excellent parking, flexible terms. Call Molly at 831/644-9800. MEDICAL OFFICE TO SHARE • SAN JOSE Conveniently located off The Alameda near Hwy 87 and 880, with quick access to both O’Connor Hospital and Regional Medical Center of San Jose. Excellent parking, recently remodeled suite with two dedicated exam rooms and private office, shared reception, and waiting area. Please email: nsl1958@yahoo.com. MEDICAL OFFICE TO SHARE IN MEDICAL BUILDING OF O’CONNOR HOSPITAL One large exam room and one office, shared waiting room, and receptionist area. Email at minasehhat@yahoo.com. MEDICAL/PROFESSIONAL OFFICE FOR LEASE Medical/Professional office 2,600 sq. ft, ground floor near Santana Row. $2.00 sq. ft. Available now. Email at sksiddiqui@yahoo.com. OFFICE SPACE FOR LEASE OR PURCHASE • SAN JOSE For lease or purchase. 900 sq. ft. space in a medical/dental office building opposite Regional Medical Center. Please call 408/926-2182. AGRESSIVELY PRICED MEDICAL/DENTAL OFFICES FOR LEASE • CAMPBELL, CA 3,000 sq. ft. and 1,600 sq. ft. office spaces conveniently located on Bascom Avenue between O’Connor and Good Sam Hospital. Larger suite has two separate entrances and break area. Space is ideally suited for separate office/procedure area configuration. Covered parking, monument signage, and elevator included. Vascular surgeon currently occupies second floor. 50 K TI package offered for 5+ year lease. Owner will build to suit. $2.25/sq. ft. NNN. Call 408/858-3586. SAN JOSE DENTAL/MEDICAL/PROFESSIONAL OFFICE FOR LEASE Two suites, 1,532 sq. ft. and 2,518 sq. ft. Plumbing ready for dental offices, can be used as medical, lab, or professional offices. Located across the street from Regional Medical Center of San Jose, 2380 Montpelier Dr.; easy freeway access to 680/101/880. Call Thuy Le at 408/272-3706. PRIME MEDICAL OFFICE FOR LEASE • SAN JOSE Excellent location. Westgate area. 1,584 sq. ft. West Valley Professional Center, 5150 Graves Ave. Suite 2/stand-alone unit. Private office, reception area, exam rooms with sinks. Available 2/1/11. Call owner at 408/867-1815 or 408/221-7821. SANTA CLARA OFFICE • HOMESTEAD AND JACKSON Plumbed for Dental/Medical, or other use. 1,200 sq. ft. Downtown across from post office and weekly farmers market. Excellent location! Dentist on site, please do not disturb. Don’t miss! Come see! Call 408/838-8191 or 408/741-1956. MEDICAL/PROFESSIONAL OFFICE SPACE • SAN JOSE Located off The Alameda near Race Street, conveniently accessible to both O’Connor Hospital and Regional Medical Center of San Jose. 1,100 sq. ft. suite with excellent parking. Asking $1.25 per sq. ft. with no triple net. Please email: tgallo@svmsmg.com or call 408/410-7533. MEDICAL OFFICE FOR LEASE • REGIONAL MED CENTER AREA Suite at new medical office building next to hospital. Three exam rooms. Ready to move in. Call 408/393-2883 or 408/206-2237. PRIVATE PRACTICE/OFFICE for sale PRIVATE PRACTICE FOR SALE IM/FP/GP. Primary care practice for sale, including inventory and equipment. Close to O’Connor Hospital. If interested, please call Stacy at 408/297-2910. EMPLOYMENT OPPORTUNITY OCCUPATIONAL MEDICINE PHYSICIANS • PRIMARY CARE, ORTHOPEDICS, & PHYSIATRY Our occupational medical facilities offer a challenging environment with minimal stress, without weekend, evening, or “on call” coverage. We are currently looking for several knowledgeable and progressive primary care and specialty physicians (orthopedist and physiatrist) interested in joining our team of professionals in providing high quality occupational medical services to Silicon Valley firms and their injured employees. We can provide either an employment relationship including full benefits or an independent contractor relationship. Please contact Dan R. Azar MD, MPH at 408/790-2907 or e-mail dazar@allianceoccmed.com for additional information. NURSE PRACTITIONER/PHYSICIAN ASSISTANT Part-time Nurse Practioner/Physician Assistant to provide care under MD supervision. Includes H&P and occasional detoxification from drugs/alcohol. Knowledge in CD is desirable, but not necessary. Physician training is provided. Call Robert Daigle, MD at 408/568-7004. have superb communication, clinical, and warm interpersonal skills. Offering a competitive salary. Located in Sunnyvale. Send CV to lbeem@eyelink.com. PHYSICIAN OPPORTUNITY Established group has opportunity for Internal Medicine physician to join. The practice is located in Los Gatos; has reasonable call schedule. Please send letter of interest and CV to fax 408/358-0261 or email to Cristine at: lrpg@yahoo.com. BETWEEN SAN FRANCISCO & CARMEL Tri-level condo right on ocean. Bedroom/bath on every level. Master bedroom offers sitting area, stereo, sauna, and hot tub overlooking ocean. Living room has wood burning stove, TV, spiral staircase to third level bedroom with access to ocean front deck. 468 Ocean View, La Selva Beach, CA. Kendall & Potter Property Management, 800/386-6826 or www.montereycoast.com. FOR SALE BEAUTIFUL PALMILLA TOWNHOME • CABO 2 Bedroom/2.5 bath/1,600 sq. ft.; golf, beach. Villa Diamonte D403. Call 408/309-8457. http://bit.ly/caboforsale. PEDIATRIC PRACTICE Will buy Pediatric practice in South Bay. Call 408/455-2959. What does this mean? It means they receive the profits, $24,000,000 in dividends in 2011! We return operating profits after expenses back to our policyholders as dividends in the form of premium credits. In California this is an average savings on premiums of 40.4%* for 2011. Over the last 21 years MIEC has returned over $144,000,000 in dividends to its California policyholders. MIEC Owned by the policyholders we protect. A Certified Success! The facts speak for themselves: • gloEMR™ is proven to have all of the functionality you need to show Meaningful Use and collect your Stimulus funds. • gloEMR™ comes with a Stimulus Guarantee. If it doesn’t help you achieve Meaningful Use, we’ll refund the purchase price of your software. * • gloEMR™ is the only locally supported EMR with Microsoft® It’ s familiar, powerful and easy to use. • gloStream™ is the only EMR company with a 100% implementation success rate. • SCCMA / MCMS has selected gloStream™ as a new member benefit. gloEMR™ 6.0 from gloStream™ endorsement by the U.S. Department of Health and Human Services or guarantee the receipt of incentive payments. gloEMR™ from gloStream™ *Please refer to the gloStream License Agreement for details and conditions. NORCAL Mutual is proud to be endorsed by the Santa Clara County Medical Association as the preferred medical professional liability insurer for its members. information and network security. DataShield coverage limits include defense costs.